THE COLOR RUN has been making its way across North America for the past year, stopping in various cities and raising money for local charities. It arrived in Seattle on May 13, 2012 and we made the trek South, for the once in a lifetime experience (unless we do it again next year!) where all ages and abilities come together to run, walk, or straggle, for Seattle’s charity of choice, which this year was Ronald McDonald House. 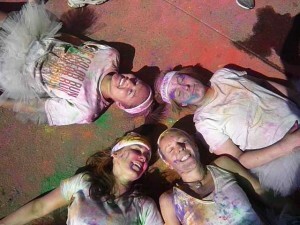 We walked, we ran, we high-fived, we whooped, we held hands and we got colored. Every color of the rainbow was represented, and the more color that was sprayed, splashed or sprinkled, seemingly the more happiness oozed out of the crowd of 7000 strong. Maybe it is all the colors of the rainbow that make the world go round! Maybe it is accepting my least favorite green just as readily as the purple being poured by the gallon, because in the end, they are only colors, and they wash away and we are left with only the skin we are in. This entry was posted in Sports, Travel and tagged Color Run, Colour Run. Bookmark the permalink.